Prismata Cup: "The best matches in Hearthstone history"
This goes without saying, given the talent present in the tournament. Below are the six finalists, who finished ahead of names like Reynad, Trump, Firebat, Hyped, Luigezz, Gnimsh, Forsen, and Backspace. Seriously, every class. Even priest. And there were THREE paladins! Though the players did not use microphones while playing, their screens were recorded. Knowing that they would be streamed, some of them found some clever ways of getting through to the audience. You won’t want to miss the chat’s reaction. The Prismata Cup is the first tournament ever to be broadcast with live updating decklists. You’ll be able to see exactly which cards are still in each player’s deck at all times, so you’ll be able to count exactly which cards a player could topdeck to get out of a tricky situation. 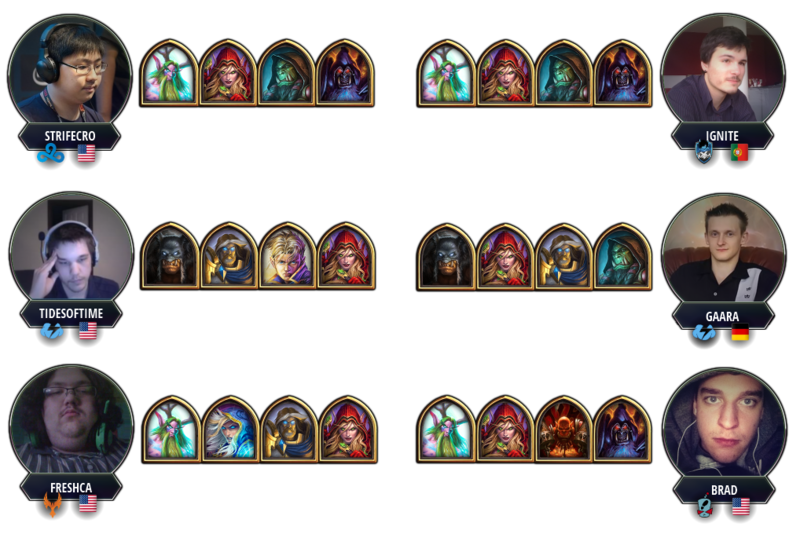 This is what the live updating decklists look like. Boxes darken as cards are drawn. A half-darkened box means that only one of the two copies remains in the deck. Part of the Prismata Cup rules stipulate that before the top 6 players begin playing the final rounds of the tournament, all of their decklists are revealed to one another. This rule—a mainstay of Magic: The Gathering—was instituted for fairness, so that players on teams couldn’t obtain an advantage if their teammates secretly delivered “scouting information” on a player’s upcoming opponents, obtained from matches in earlier rounds. Revealing all of the decks ensured that all games were played on a level playing field. 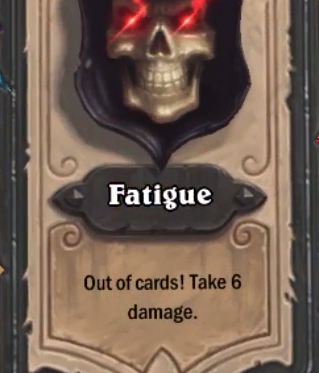 However, the deck reveal also had one unintended, brilliant consequence: in games that went to fatigue, players knew what their opponents held in their hands. Exactly. To the card. This resulted in several interesting and highly tactical “endgames”, in which players jockeyed for position, matching each other card-for-card while attempting to out-calculate one another to be the last one standing. This didn’t just happen to one player. It happened to both. The last few turns of this game may downright bring you to tears. I’ve played Hearthstone intensely since the early days of the beta, but this single game has given me a completely new understanding and appreciation of how deep Hearthstone truly is. The situation in question could could never have happened without the decklist reveal rule, and you’ve probably never seen anything like this before. But it will blow your mind. You need to see it. And you’ll want to be there live, when the twitch chat erupts into a crazed frenzy. The Prismata Cup airs tonight on twitch.tv/itshafu at 6:00pm EDT, casted by Trump and Hafu. Alex Wice looks for awesome experiences. Never satisfied, his audaciousness has taken him through math olympiads, high stakes poker, and dozens of countries. As a founder of Lunarch Studios, Alex has an enthusiasm for crafting beautiful user experiences through great design, for understanding the motivations of players playing games, and for appreciating what works and doesn't work in the plethora of games he has played.